Queen Street – where does it begin? Where does it end? Queen Street at one time was Kingston Road, and then at one point in time one section became Queen, and Kingston was rerouted to where it begins presently, where Queen and Kingston meet. Historically, we will start Queen Street where in my humble opinion the ‘Beach’ began – that is, at the Ashbridge Estate. The Ashbridge family came from the U.S. after its war of Independence and settled on a few hundred acres of land in the present East End of Toronto. The family was headed by the matriarch, Sarah Ashbridge, and her family in 1793. The family was one of the original pioneers. Their homestead was near the present-day location of 1444 Queen St. E., and this is where I would place the beginning of the Beach. The Ashbridge estate, overlapped with present streets, went from Greenwood to Coxwell Avenue. The next pioneer was the Small family, who occupied the land from approximately Coxwell to Woodbine Avenue. The Smalls were brought over from England to help Lt. Gov. General Simcoe organize the territory which was later to be Ontario. Queen Street in the East End is as old as Toronto, beginning in 1834 over the Don – these suburbs were called Liberties and ended at the present MacLean Avenue. In later days, around 1908 to 1910, the city expanded right to Victoria Park, although in our case we will go to Fallingbrook. On Queen there were at least five amusement and pleasure parks. Starting from Coxwell and Queen around 1900 was Smalls Amusement Park, which was known by different names. Another was the Woodbine Race Track which often held carnivals and other recreation activities besides horse racing. Another picnic grounds was Kew Gardens (approximately 1876 to 1907). There was Scarboro Beach Amusement Park from 1907 to 1925. Another was Munro Park from 1896 to 1906. And finally there was Victoria Park from 1876 to 1896. All of these parks formed the reason why people from the city and beyond flocked to the beautiful Beach. The natural elements were their green luscious grass, silver, sandy beach, the cool, glistening water – all of nature’s bounty, a haven for the people of the drab dismal city of Toronto. Woodbine Avenue is where the purists all say is the beginning of the Beach. With the old fire hall standing as a sentinel, one might believe this is true. Kew Beach Fire Hall, era 1904-05, still stands with its clock tower counting historic times for the Beach community. This part of Queen originally was a dirt path that was opened up by pioneers such as Joe Williams of Kew Beach fame, and then later the homes and businesses arrived. On the southeast corner stood the stately home of Wm. Williamson, contractor-builder, built around the 1890s. Williams built the older Woodbine racetrack, Williamson Road School and many of the original cottages on the waterfront and the side streets. Originally the houses off Queen Street – Kippendavie, Kenilworth, Waverley, Lee – were cottages. The Beach area was the Muskoka of the City of Toronto. Later the businesses and storefronts arrived in front of the houses. Going east at Kippendavie and Queen, we have the home of Norman Jewison, born on the southwest corner; on the southeast we have Kew Beach School, one of the oldest. On the north side we have the original Phillip Whitelocks store; later he would move to another location. Homes started sprouting up on Queen Street. This was the place to be. We would have religious places of worship. The Baptists came to Kenilworth Avenue, then moved up the street to Waverley Road. The old church would become the Beaches Hebrew Institute and later Beaches Synagogue (which just celebrated 90 years in the Beach). All religions came to live and worship in the Beach area, and still do to this present day. At Queen and Bellefair, we have Bellefair Methodist Church, later to become Bellefair United. On the south side was the original Kew Beach fire hall, it was a volunteer fire hall on land donated to the community by Joe Williams. At Queen and Lee we have the financial and commercial hub of the Beach. The Royal Bank, Toronto Dominion Bank, Bank of Nova Scotia: all were located in this area. The Beaches branch of the Toronto Public Library, nearly 100 years old, stands silently with the owl as the literary guide to all of those who love to read. We had the Beach Theatre which was the largest theatre in the Beach, and the Family Theatre at Queen and Lee. We had the coliseum at Wineva and Queen, the Fox (formerly the Prince Edward, at Queen and Beech). These were the places where adults and children would see silent movies and later the talkies, all part of the Beach. The Beach had sports galore. At Kew Beach we had 7,000 people coming to see a baseball game in the 1930s; lawn bowling was in fashion, along with tennis on the Lakefront and canoeing. Whatever one wanted in sports or entertainment, we had/have it here in the Beach. People came in droves 100 years ago and they come in droves now to hear and see art shows, the Beaches International Jazz Festival and more. Nowhere else can you see events like this, only on Queen Street in the Beach. Continuing on to Wineva is the United Church, circa 1882, originally the Union Church, later a Presbyterian Church, later a Methodist Church, now Beach United again, proud of its heritage. Moving along, we come to Glen Manor and Queen where on the south side we have the architectural wonders of the Price brothers Development, lovely columned large homes unlike any in the province of Ontario. On the north side of Glen Manor and Queen we have the Glen Stewart nature trail – an oasis in the middle of the Beach running from Queen Street. You can walk north through the luscious green grass, through lovely unhampered trees with a beautiful stream in the middle of this great natural expanse. The sounds of birds of all varieties, and trees and squirrels are in abundance in this natural hideaway running up to Kingston Road. Keep moving past the lovely homes on Queen to Balsam Avenue, straight to Beech Avenue and Queen, where the Balmy Beachers are located. At the bottom of Beech stands the Balmy Beach club which is noted for its great spoils and achievements over the years. B.B.C. has won more olympic medals than any other sports club, as well as winning the Grey Cup in football in 1927. Going east to Silver Birch, we come to St. Aidans Anglican Church. St. Aidans was originally a tent church which drew hundreds of worshippers on Sundays, who came to the eastern Beach for over 170 years. The architecture on these streets was more fashionable and the homes larger – homes were built of stone and had larger lots, again an eclectic type of architecture in the Beach. At the end of Queen Street we find the other sentinel of Queen: the R.C. Harris Water Filtration Plant – the ‘palace of purification’. It is a National Historic Site because of its art deco style. It is the only building in the Beach that cannot be demolished. Fellow Beachers, this is just a few paragraphs that I have written on Queen Street – the original pages I have written are well over 100 pages, so I modified them to what you read now. I will keep writing additional stories on Queen to try to save our lovely street, but I need your help to stop the intrusions on Queen St.
One of the things that is long overdue on Queen Street East, particularly in The Beach is to curb the craziness of both sides of the road on street parking on Queen street. Cars should either be restricted to parking on one side of the street only, or better yet, in certain areas there should be NO on street parking at all. It is horrible grid lock what with the Streetcars driving up the middle of the road along with all the cars, with giant SUV’s parked on both sides of the road. It should not take an hour to go from Woodbine to Yonge street on the Queen Street Car, but due to the horrible gridlock, sometimes this is the case which really curbs down on visitors taking the TTC to The Beach–which just further exacerbates the gridlock as people assume TTC means Take The Car and do just that. 10 years ago TVO ran the Best Main Street in Ontario Contest. I entered my “200 words or less” submission along with then trendy JPEGS!. I am an urbanite and assumed there is some grand street that everyone stops at on their way up to the cottage, but I hoped Queen Street would be an honourable mention. Much to my delight TVO notified me that Queen Street was the winner! There was tough competition from towns such as Gravenhurst, Goderich, and Port Hope that wanted the distinction. However three judges, an historian, an urban planner and retail consultant unammioulsy chose Queen Street East. The Street that works! People use It.! You can buy a latte but also buy a bucket of bolts. The Beach Metro kindly printed my entry of what I LOVE about Queen Street along with my photo that summer. Ten years ago, if I were to make a list of what changes I would love to see along the newly crowned Best Main Street in Ontario, it would have included handicap ramps, power shop doors, more traffic lights, slower traffic speed, hanging flower pots, more shops in historic homes along Queen, historical plaques, benches, a farmers market , Ontario Jr. Baseball on Saturday nights, Classical Music in the Band Shell, Kew Cottage Culture Centre, a High Tea Restaurant and Retro Night at the Fox. . Some of these community minded additions have come to fruition. These types of changes make the street better and better because they come from Beachers! Hi Mary – I liked your post – but traffic is already pretty slow from all the congestion! I was wondering if you have any more information on TVO’s choice of Queen – such as a video or transcript of the TVO show about it! 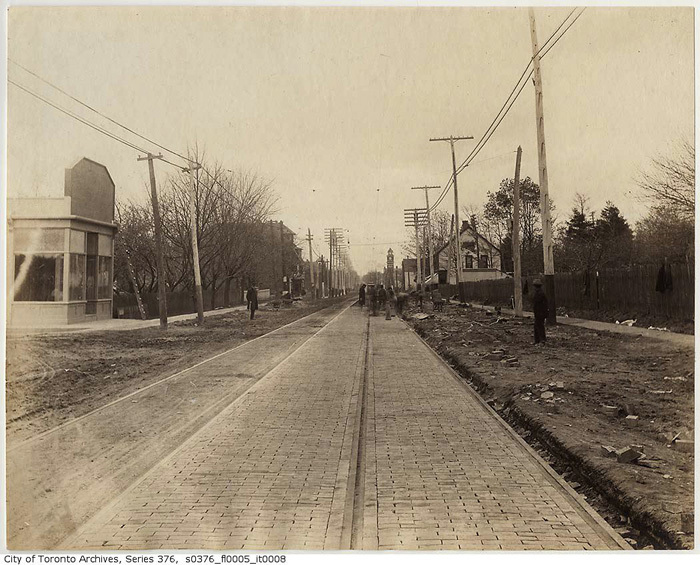 This photo was taken after 1906, looking west from Lee Ave. If you look to the west you can see the “Kew Beach Fire Hall” clock tower. The fire station was completed in 1906. I am a resident in the beach and was wondering if you know the date of the garage sale they hold every year for The Cure all around the beach area.